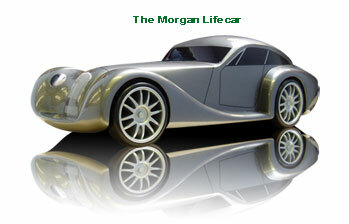 The Morgan Lifecar fuelled by hydrogen gas fuel cells. Hydrogen Gas is a volatile gas at room temperature, but when chilled to -253C and compressed, it makes the perfect fuel. Hydrogens' greatest feature, as a fuel, is that it causes no pollution. A hydrogen fuel cell works by combing hydrogen gas with atmospheric oxygen. The resulting chemical reaction generates electric power, and the only by-product it produces is clean water. At a time when there is real concern about global warming due to carbon emissions, this makes hydrogen fuel a desirable technology and perhaps the most feasible alternative to petrol and gasoline. Many scientists and researches are working towards a vision of the hydrogen economy. Hydrogen based fuel could potentially be used to run our cars or even drive larger scale power plants, generating the electricity we need to light our buildings, run our kettles and fridges, and power our computers. But hydrogen does not occur naturally and it has to be processed. The big challenge is the large scale production of hydrogen in sustainable way.